Arctic sea ice area and extent remained at record lows today as very warm Arctic conditions suppressed re-freeze for this time of year. According to JAXA (the Japanese Space Agency), sea ice extent for today was 8.47 million square kilometers — or about 1.7 million square kilometers below the 1980s average for this date. According to Cryopshere Today, Arctic sea ice area was 7.11 million square kilometers — or about 1.8 million square kilometers below the 1979-2008 average. This value for sea ice area was also about 70,000 square kilometers below yesterday’s value, showing that sea ice area fell at a time that usually includes rapid re-freeze. Minor ‘melts’ of this kind can happen in November. However, given the fact that we are already in record low territory, any ice recession results in compounding a serious Arctic melt problem. Arctic sea ice melt is still the driving factor in global sea ice totals. Today, global sea ice averages also remained in record low territory. 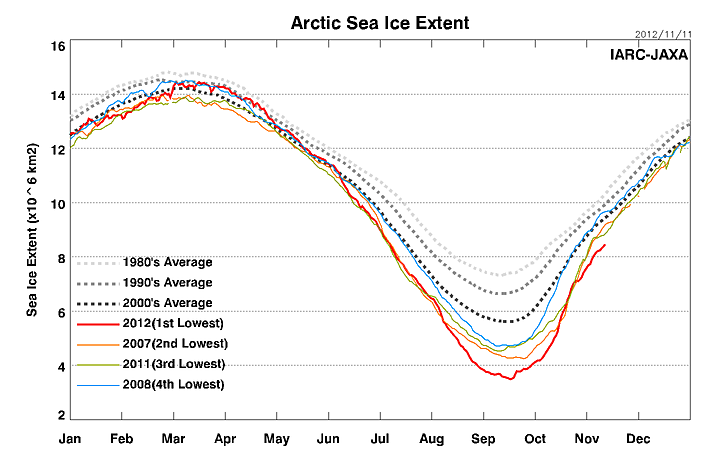 The likely causes of continued record low Arctic sea ice values are manifold. First, temperatures are abnormally high for this time of year. Looking at the image below, we can see that Arctic temperatures range from a, very warm, 7 degrees Celsius above average to a stunning 20 degrees Celsius (or more) above average. When combined with a large zone of hotter than average temperatures in Europe and Asia, these extreme temperatures are likely pushing global averages into record ranges for the month. Another graph, showing temperatures above the 80th parallel, reveals very high Arctic temperatures in that region as well. Likely aiding in these high Arctic temperatures are very large peaks and troughs in the jet stream. The troughs, likely caused by receding sea ice influencing the jet stream, are pushing powerful storm systems into temperate zones throughout the northern hemisphere. A couple of weeks ago, Hurricane Sandy combined with one of these Arctic-born weather systems to severely impact the US East Coast. Just yesterday, another powerful storm, fueled by these Arctic troughs, ripped through Europe dumping enough rain to create the 6th worst flood in Venice’s, very long, history. It is possible that the new weather pattern caused by Arctic sea ice melt will result in more strong storms for the US East Coast and Europe this winter. In addition, that weather pattern is also transporting heat from the south up into the Arctic, further enhancing warming and reducing re-freeze. This air, dredged up from the tropics, is likely to result in sea ice being thinner and more fragile than usual at the end of this year’s freeze season. 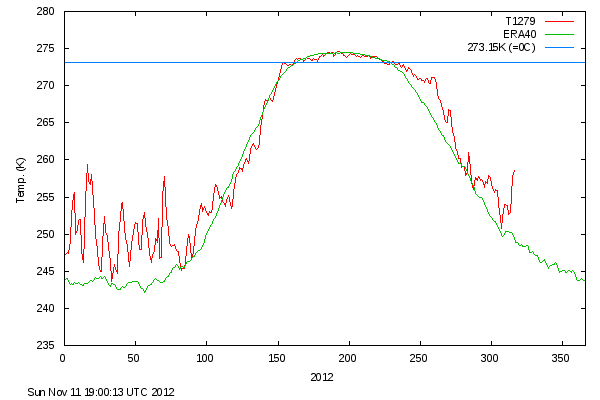 The result is that next summer (2013) may see even worse melt than that experienced during 2012’s record season.